The Chief Khalsa Diwan was established in 1902 and now registered as Chief Khalsa Diwan Charitable Society under the Society Registration Ac bt 1860 promoted by a group of well known industrialist, Businessmen, Professionals and Philanthropists with an aim to promote quality education in the field of Technology. The Primary purpose of the society is to provide and impart education at all levels of the society. The history of the Chief Khalsa Diwan goes back a century which itself is a record and landmark in the field of education. Training & Placement cell or Career development centre (CDC) as we like to call it at CKDIMT has an important role to play in student’s future and is an indispensable pillar of strength for the Institute. This department continuously strives to help students in pursuing their career goals by acquiring employment-seeking skills and ultimately to attain desired employment. This is accomplished through building a strong partnership amongst students, faculty members and industries. 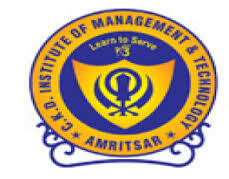 C K D Institute of Management Technology, Amritsar offers various graduate courses as well as Post Graduate courses. C K D Institute of Management Technology, Amritsar is affiliated to Punjab Technical University, Jalandhar. List of facilities available at C K D Institute of Management Technology, Amritsar for students.